SOFIA during test observations of the night sky in March 2008. The opening in the fuselage of the converted Boeing 747SP provides a glimpse of the 2.7-metre infrared telescope, built in Germany. SOFIA, the Stratospheric Observatory For Infrared Astronomy, during the first test flight with the telescope door fully open, on 18 December 2009 over the Mojave Desert in California. The 2.7 metre telescope, built in Germany, is visible in the opening in the fuselage of this Boeing 747SP. The test flight with the door open helped engineers examine, for the first time under experimental conditions, the movement of air in and around the telescope and the door. SOFIA above its base, a hangar at the NASA Dryden Aircraft Operations Facility (DAOF) in Palmdale, California (front/right). SOFIA, the airborne infrared observatory, in front of its hangar at the Dryden Aircraft Operations Facility (DAOF) in Palmdale, California. The DAOF is operated by NASA's Dryden Flight Research Center. This photograph was taken during night-time test observations in March 2008. 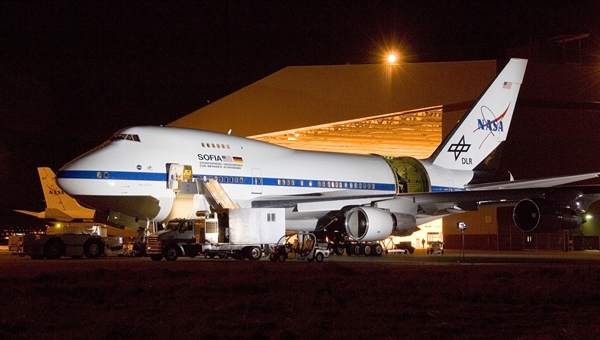 The Stratospheric Observatory for Infrared Astronomy (SOFIA) is a joint German-US space science project. 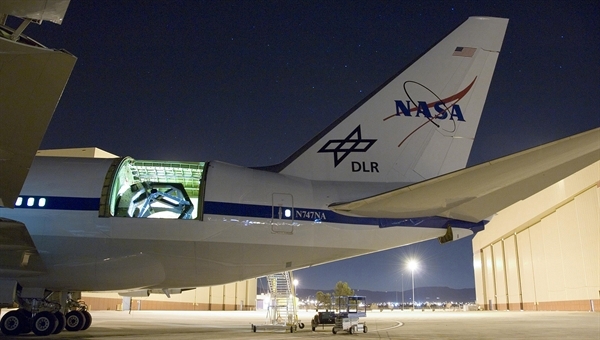 Carrying a 2.7-metre telescope inside a modified Boeing 747SP, the airborne observatory performs astronomical observations in the infrared and submillimetre wavelengths, high above the disturbance of Earth's atmosphere. The scientific objective is to understand the development of galaxies and the formation and evolution of stars and planetary systems from interstellar clouds of gas and dust. Until the mid-nineties, astronomers had been using NASA's 91-centimetre Kuiper Airborne Observatory (KAO) to obtain astronomical data at infrared wavelengths by observing high in the atmosphere. This area of the electromagnetic spectrum is, for all practical purposes, inaccessible to ground-based observatories. One notable result of the KAO measurements was the discovery of the rings around Uranus. Areas of the infrared spectrum remain unexplored, which persuaded scientists from the US and Germany to highlight the need for a new infrared astronomy observatory that would function as a modern successor to the KAO. This new airborne observatory needed greater angular resolution, enhanced sensitivity and higher spectral resolution to answer fundamental questions about galactic and extragalactic astronomy, and about the origins and development of our own Solar System. In late 1996, NASA and DLR agreed to develop and operate this new observatory, SOFIA - the Stratospheric Observatory for Infrared Astronomy. Following integration of the telescope and finalisation of structural modifications to the aircraft, flight tests commenced in April 2007. Since early 2008, SOFIA is housed as its home base, NASA’s Armstrong Flight Research Center's hangar 703, in Palmdale, California. After further modifications to the aircraft, the observatory underwent a comprehensive range of flight tests scheduled to commence in December 2009 to prepare for operation. At the end of May 2010, SOFIA took off for its first astronomical test measurements, and completed the 'first light' flight. Beginning in the autumn of 2010, the observatory will be available for scientific use. Extended test phases are also scheduled for the first two years. FIFI-LS (Far Infrared Field Imaging Line Spectrometer) under the aegis of the Max-Planck Institute of Extraterrestrial Physics in Garching. These two instruments are being financed by the Max-Planck institutes and university institutes involved, with the latter sourcing funds from the German Research Foundation (Deutsche Forschungsgemeinschaft; DFG). 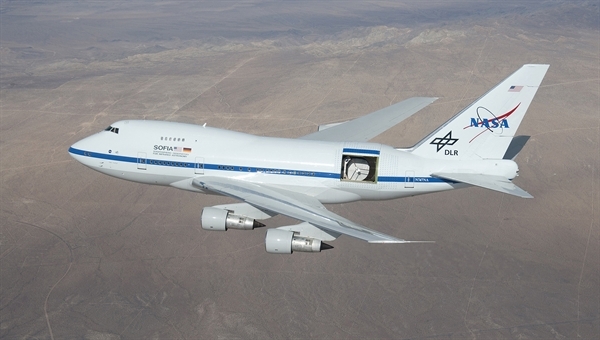 The platform for SOFIA's 2.7-metre infrared telescope, is a second-hand Boeing 747SP that will operate at altitudes in excess of 12 kilometres. Below this altitude, water vapour in the troposphere hinders observations in the infrared. This is why ground-based telescopes are able to receive infrared radiation from heavenly bodies only through narrow wavelength 'windows'. SOFIA will have ten times the sensitivity and triple the angular resolution of KAO. SOFIA is scheduled to remain in service for 20 years, and will carry out about 160 astronomy flights a year, each flight lasting between six and eight hours. SOFIA will be used by roughly 50 groups of scientists who are selected at an annual scientific peer review meeting. These frequent flight opportunities, with the very latest technology, mean that scientists can benefit from great versatility. Through direct access to the instrument during each flight, young scientists have the opportunity to gain hands-on experience of their own measurements and are able to leverage these into scientific publications promptly. The flexibility of SOFIA permits worldwide access to 'targets of opportunity', that is, the chance to observe astronomical objects which appear at short notice. Thanks to its relatively short instrument development cycles, SOFIA makes an excellent platform for testing instruments destined for use on board satellites. The terms of this collaborative venture between NASA and DLR are laid out in a Memorandum of Understanding (MoU). This MoU defines the distribution of work packages during the development and operational phases. Germany has supplied the telescope and will bear 20 percent of the annual operational costs, in exchange for which it will be assigned about 30 scientific flights per year. 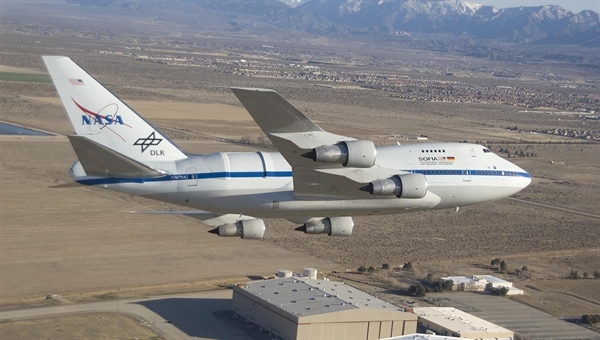 NASA has purchased the second-hand Boeing 747 and converted it for installation of the telescope and is also in charge of operating the observatory from its home base in the US. NASA and DLR have awarded industry contracts to deliver on their appointed tasks. The SOFIA telescope was developed and built by two companies on behalf of DLR: MT-Mechatronics (previously MAN) and Kayser-Threde. It was delivered for integration at Waco, Texas, on an Airbus Beluga transport aircraft. Dozens of other companies in Europe have collaborated on the development of the telescope as subcontractors to MT-Mechatronics and Kayser-Threde. To deliver Germany's contribution towards operations in the US, DLR signed a contract with the University of Stuttgart in November 2004, and this was extended for another four years in early 2009. The German SOFIA Institute (Deutsches SOFIA Institut; DSI) at the University of Stuttgart manages this contribution. Apart from the German contribution towards SOFIA for operations in the US (which include the assignment of 15 personnel, purchase of spare aircraft engines, spare parts for the telescope and fuel costs for the German flight quota), DSI was placed in charge of coordination of scientific aspects, and education and public relations work in Germany. The German State of Baden-Württemberg makes a financial contribution towards this.